FEBRUARY 1989 PAGE 7 of 7 The post game congregation. The Forum clock. 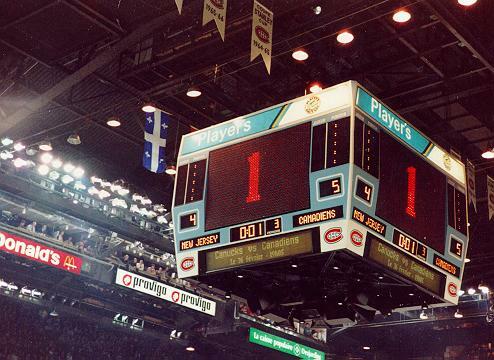 Habs win, habs win...as they did quite often in '88-89. To summarize the game...the Habs got off to a great start and had a 5 to 1 lead (I think) but the Devils started to come back and got as close as 5 to 4, but the Canadiens hung on for the win. Richer was flying that year...I think he had two goals in the game. Corson is the only full-time member that is still with the team, and he spent time with other teams, but Benoit Brunet did play 2 games with the Habs that year. 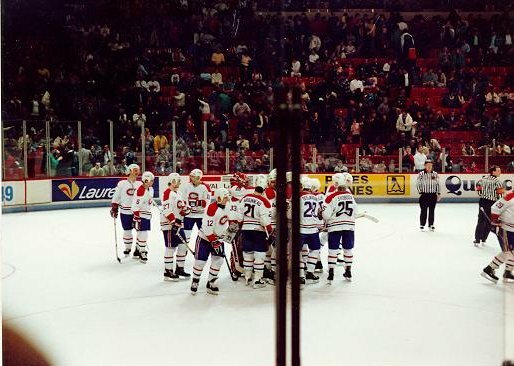 The Habs were quite a good team in 1988-89, good enough to make the finals against Calgary. As everyone knows they lost in six games.